Use SignalFx to monitor Azure SQL Elastic Pools via Microsoft Azure. Azure SQL Server Elastic Pool: Shows metrics of an Elastic Pool. Azure SQL Server Elastic Pools: Shows metrics of all Elastic Pools being monitored. eDTU Used per Database in Elastic Pool vs eDTU Limit - Shows a comparison of the eDTU limit to the eDTU used aggregated by database. DTU Percentage Trend - Trend of the DTU used percentage aggregated by database. Server CPU Percentage - Shows the load on the CPU aggregated by database. Data I/O Percentage - Shows the used percentage of Data I/O aggregated by database. Log I/O Percentage - Used percentage of Log I/O aggregated by database. Elastic Pool Storage Used Percentage - Trend of total elastic pool storage used. Elastic Pool Storage Used per Database - Trend of total elastic pool storage used aggregated by database. Top Elastic Pools by DTU Consumption percent - Lists the elastic pools with top DTU consumption percent. Top Elastic Pools by eDTU Used - Shows the eDTU used stacked by elastic pool. Top Elastic Pools by Total Storage - Shows a stacked chart of the total storage aggregated by elastic pool. Top Elastic Pools by Storage percent - List of the elastic pools with top used storage. 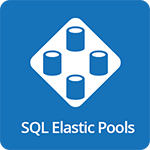 For more information about the metrics emitted by Azure SQL Elastic Pools, visit here.